A prolific screenwriter, producer, and director for film and television, Richard Curtis has earned international renown for his award-winning comedic storytelling. His most personal project — eradicating poverty worldwide — is a story still in production. 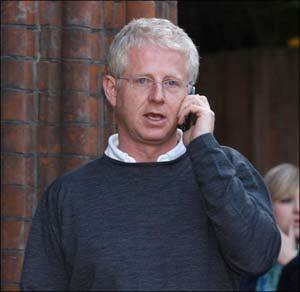 A New Zealander by birth, Richard Curtis is best known as the Oscar-nominated screenwriter for the popular British romantic comedies Four Weddings and a Funeral and Notting Hill, as well as the Mr. Bean television series. His most recently broadcast film, HBO’s Emmy-winning The Girl in the Café, asked hard questions about Third-World debt and poverty in Africa. In addition to co-founding the Make Poverty History campaign and the Live 8 concerts, Curtis founded Comic Relief UK in 1985 to raise money for victims of famine in Ethiopia. His comedy tries to recreate the good feelings of being with family talking about your aunt. Hiring the right person: Have to pick the actors for the right reasons, not because of they latest success otherwise goes all wrong. Getting best out of someone: Help them discover the answer themselves. Has to come from inside the person. Remember the reason you do something. Resolving conflict: Try to avoid it in the first place with actors. But ask what’s the reason they’re tense. Keep cool and do your homework. Learned that things aren’t disastrous when things go wrong. Don’t panic, probably would have been cut or will get fixed later. Nobody ever feels they have enough money to do the job properly. Passionate about writing optimistic movies. Nasty is not more true. Spent four years in the Philippines as a child. His mother cancelled Christmas gifts to give money to a famine. Visited Ethiopia in 1984 during famine. It was there that he hatched what he would do for the next 25 years. Do what I do (write comedy) but do it to rectify this grave injustice. Fighting for the poor to have the right to laugh and have a good time. Red nose days. Make over 100 million pounds and other such events. A national day of giving. Pursued the American Idol people to help the poor and ended with Idol Gives Back. Challenges his friends to get involved. “Even my not-friends.” Not embarrassed about asking because people want to do things that have great effect. Results of Idol was $73 million and large viewership. More has to be done. Any normal person can see this if they face it. The Sermon on the Mount is foundational to what he has done. Started it all. i've seen my friends lose themselves in the luxury of political theory. You have to get up and do something. Can't let yourself off the hook after reading the Bible. Can't pray for people at night and not try to help them at the end of the day. "The other day my son said he wanted to take care of the poor children like his dad but afraid that after Red Nose Day there wouldn't be any more poor children." What grade would you give the church? All I know is that someone shouldn't be starving. It's our God-given duty. If we believe it, we can halve poverty. Churches shouldn't let their leaderss off the hook. We can achieve world poverty being crushed in half a generation. Hybels: Can you leverage what you do well to rectify this injustice? Usually get this passion when they have an encounter with God and with the need. I'm done with just adding more stuff to my over-stuffed life. Sum total of life in things. Be real sure about the affections of your heart. When you do the right things, the buzz endures. But not with things. Calling all of us to a life like that. Dream of the day when it's normal for every church to fight AiDS, racism.... We're writing the next chapter of church history and you've got a guy who's not sure about his faith cheering the church on to make a difference. Another great winner of a session. Powerful. A call to compassionate action. Another opener for a "missions conference" Five Oaks style?